Five Things Friday: Christmas Card Ideas | Keeps Me Out Of Mischief! 1. Card Inspirations has these kits with pre-punched holes to stitch these snowflakes. Don’t think it would be too difficult to create your own version. 2. Glenda’s Paper, Scissors & Rocks has this great way to use up scraps of wrapping paper. 3. Martha Stewart has this lovely pop-out idea which looks really easy to make. 4. I re-pinned this one from Pinterest but unfortunately the link is broken. I think this idea using rolled up paper could be adapted for a Christmas card. 5. 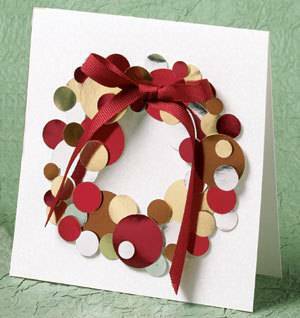 Curbly has this idea for a Christmas wreath made from different sized punched circles. Just got to get on with them now! Pingback: Happy Birthday Keeps Me Out Of Mischief! | Keeps Me Out Of Mischief!